What's the point of shaping after bulk fermentation? Here you can see the most recent result, but wondering if the process inherently leads to inferior crumb structure (I'd like it to be way more open). 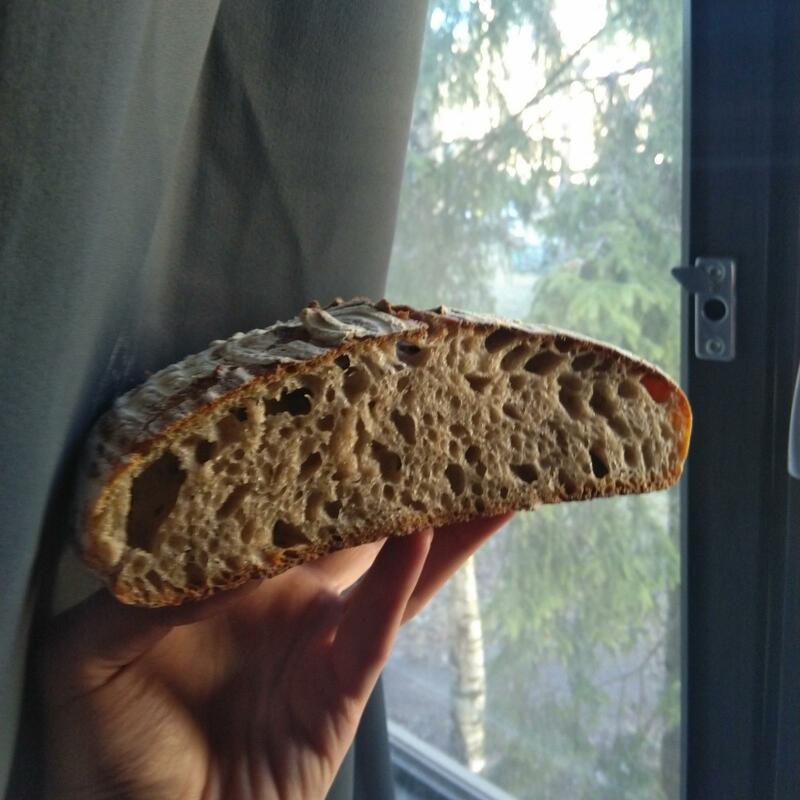 Recipe is "Beginner's Sourdough Bread" from www.theperfectloaf.com. Although instead of bread flour I used AP flour (protein 12 %) for a less gummy crumb. I make this recipe about once a month. I’m a beginner so I follow his timeline, temperatures, and process order but using KA bread flour. He uses Bob’s. My loaves are higher and more domed but the crumb structure is not tons more open then your picture. So those are two things I do differently-the flour brand and the order. Have you asked the blogger who developed it? He seems willing to answer questions. I’m sure you will get more in depth answers from more experienced bakers. Why would this be such a universal custom, unless it mattered? I'm extremely good at avoiding work, but I can't be the only such person who ever lived. 😁 If it wasn't useful, why would bakers in so many countries around the world keep on doing it? On the other hand, what if it's a mere tradition, perhaps an unnecessary vestige of something that was once important in the past? What if simplifying the process works just as well, or close enough? As David says, the only way to be sure is to try both ways. In general, bulk fermenting lets the yeast do its thing until they have eaten most of the food and expelled a lot of gas. I have heard that yeast are very immobile, and so by shaping ( what used to be called knocking down ) the dough after BF, you redistribute the yeast, and give them access to more food, so they can do their magic again, during final proof. While you say you want to shape, final proof , retard, you do know that you can, and I have, BF then retard, then shape , then final proof and retard - which allows you extra time to develop flavor . To me, it makes way more sense to bulk ferment in a bakery setting. The practicality of not having to knead a dozen loaves worth of dough seperately but rather in bulk and by less labour intensive means such as stretch and folds comes to mind. However, I'll have to try and test whether the traditional way of doing things has more to it than practicality for mass production! I thought about your question and these ideas came to mind. In the majority of sourdough bakes the bulk ferment last 4, and often more hours. The bulk ferment takes place in a warm environment under normal situations. During this time flavor and aroma are greatly inhanced. But something else is also taking place. The gluten is relaxing tremendously. The preshape and final shape do much to tighten the skin, thus strengthening the dough in order to better hold its shape during the bake. Barry’s idea is something I’ve not tried. I think his method might produce a more acetic sour, which many like. But I almost always cater the flavor for lactic acid. And that requires extended fermentation and warmth. His idea may fit your schedule. It is an interesting concept. Gluten relaxation might be a key player here! I'll just have to find time in my schedule to test out, how the tightness of the boules is affected. You can do it, you just won't get the same kind of pop and beautiful upright loaf you get from retightening the gluten closer to bake time. Aside from that though, your loaf looks very overfermented and sour. You can see at the top how the crust is pulling away from the crumb, which is too 'out of gas' to follow along. In my opinion, the stretch and folds and the preshape and shaping are an opportunity to guage the level of fermentation your dough has going on by touching your dough. Why don't you try to do the same procedure, except instead of letting it bulk overnight, let it half bulk, like 2 hours, then put it in the fridge. Take it out and shape when you wake up, and let the loaf warm up/proof while you're at work. I think this method will get better results for you. Have you both shaped a properly fermented dough and an under fermented one? It is much easier to shape a properly fermented one. It is much less sticky, for instance. It is also easier to generate tension when you shape. I'd imagine that you should expect much less oven spring if you shape your dough early on the scheme of things. I had thought about the issue of the 'two fermentations' before. In fact, this is an artificial division. Once you add in the levain, the dough starts to ferment and it only stops doing so when the organisms die in the oven (at around 50C or a little under it). I think the whole point is this: assuming you want to create structure and have good oven spring, it makes sense to generate tension in your shaping and put your dough somewhere like a banneton, so that is keeps that tension until it can spring in the oven. It seems that the optimal way to do so is by letting the dough ferment before you shape it, for the reasons I pointed out above.